The Kingdom of Hatti, with its heart in central Anatolia, became a major threat to Egyptian control of Syria/Palestine during the Amarna period. The history of the Hittite empire is divided into three periods: the Old Kingdom (ca.1700-ca.1500 BCE; from the Egyptian Thirteenth Dynasty to end of Seventeenth), the poorly-documented Middle Kingdom (ca.1500-ca.1400 BCE; beginning of Eighteenth Dynasty), and the glorious New Kingdom, or Empire Period (ca.1400-ca.1190 BCE; from Amenhotep III to the end of the Nineteenth Dynasty). There are few documents surviving from the Old Kingdom. Much of what is known about its history comes from a single document called "The Edict of Telipinus". Telipinus was one of that period's last kings, and attempted to contrast the sorry condition of his day by comparing it to the glorious past. The Hittites considered a Labarnas mentioned in the "Edict" as the founder of the dynasty, but he may not have been in fact. However, his name and that of his wife Tawannannas were frequently used in royal names in later times. His son Labarnas, called Hattusilis, became king. He seems to have been the nephew of Tawannannas. He is called both "King of Hattusas" and "Man of Kussara", so it is possible that the original capital of the kingdom was at Kussara. In any event, he moved to Hattusas, which had previously been destroyed by another king of Kussara, and made it the Hittite capital, which distinction it would retain nearly uninterrupted during the entire history of the Hittite kingdom. The identification of ancient place names from such texts as the "Edict of Telipinus" is often controversial, but some Hittite cities have been located, such as Tuwanuwa (classical Tyana, near modern Bor), Hupisna (classical Heraclea Cybistra, modern Eregli), Parsuhanda (probably modern Acemhöyük), and Lusna (classical Lystra). Landa was probably in the north, but the rest of these cities are south of the Kizil River (ancient Halys), in an area called by the Hittites "the Lower Land". 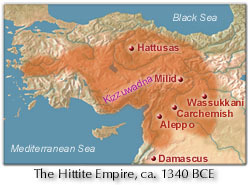 This indicates the early Hittites began their empire by crossing the Kizil and moving to the south. After the death of Telipinus towards the end of the Egyptian Seventeenth Dynasty came a brief period of obscurity that lasted until the beginning of the Hittite empire under Suppiluliumas. The Syrian provinces fell to Hanigalbat, which was a Hurrian kingdom. They in turn lost them to Egypt after the eighth campaign of Tuthmose III. King Tudhaliyas II conquered Arzawa and Assuwa in the west and entered into a treaty with Kizzuwadna, later incorporating it into his kingdom. It appears that the Egyptians were allied with the Hittites and aided them in their successful attack on Aleppo. This cooperation can be inferred from an agreement, dating to early in the reign of Tuthmose III, in which a Hittite king, probably Zidantas II or Huzziyas, would pay tribute to Egypt in return for certain adjustments of the frontier. In the north, however, the Hittites were threatened by Kasku tribes which blocked access to the Black Sea. The son of Tudhaliyas II, Arnuwandas I, succeeded him but had problems in every direction. Hattusas was burned down and Arzawa became independent; its king is mentioned in the Amarna letters. The Hurrians founded a new state known as Mitanni and began to threaten the Hittites' southern borders. Early in the reign of Tuthmose's son Amenhotep II, Egypt formed an alliance with the Mitanni that would prove disastrous for the Hittites. They lost their Syrian holdings and the Mitanni advanced into Kizzuwadna in southern Anatolia. A daughter of Artatama I of the Mitanni married the young Tuthmose IV, thereby cementing the alliance. Arnuwandas's son Tudhaliyas III spent his reign campaigning in attempts to gain back lost territories, but success would only come to Tudhaliyas's son Suppiluliumas. Suppiluliumas gained military experience with his father before becoming king in his own right sometime during the reign of Amenhotep III (some would give him a shorter reign beginning during that of Akhenaten). He began by rebuilding Hattusas and consolidating Hittite lands before attacking the Mitanni. He sacked its capital, Wassukani and gained control of northern Syria, advancing nearly as far as Damascus. Egypt under Akhenaten did not react to the destruction of her allies the Mitanni, and Suppiluliumas made treaties giving him control over Nuhassi (central Syria), Amurru (Lebanon), Aleppo, and Alalakh. Carchemish retained its independenceand its control over the Euphrates River crossingfor a time. Suppiluliumas left his son in control of Syria, but trouble broke out there when the Mitanni king Tushratta was assassinated and his successor, Artatama, gave up on Egypt and made an alliance with the Assyrians instead. Suppiluliumas returned immediately, captured Carchemish after an eight-day seige, captured Wassukani, and arranged affairs more to his liking: one son he installed as king of Aleppo, another as king of Carchemish, and in Wassukani he made a loyal son of Tushratta the king of a vassal buffer state between the Hittite and Assyrian empires. According to Hittite history, it was during the seige of Carchemish that Suppiluliumas received a message from widowed Queen Ankhesenamun, asking him for one of his sons to be king of Egypt. Suppiluliumas was unable to avenge the mysterious death of the son he eventually sent, because he fell victim to the pestilence then raging in the Levant, as did his eldest son, Arnuwandas II, soon afterwards. The younger and more inexperienced Mursilis II gained the throne around Year 2 of Ay, and had further problems almost immediately. The Assyrian king Ashur-uballit I captured Wassukani and thus established an Assyrian border with Syria along the Euphrates. Fortunately for Mursilis, Carchemish and Aleppo remained loyal, so he was able to turn his attentions to successfully quelling the revolt in Arzawa with its satellite principalities Mira, Kuwaliya, Hapalla, and the "land of the River Seha". The Kaska people who separated the Hittite homeland from the Black Sea also revolted, and with their guerilla tactics were never completely quieted by the Hittites. This unrest disturbed the vassal state Azzi-Hayasa to the east on the Upper Lycus river, who had also sorely troubled Suppiluliumas early in his reign. Since Mursilis was busy with religious duties in Kummanni, he sent a general to pacify that rebellion. While at Kummanni he was joined by his brother Piyasilis, the king of Carchemish, who sickened there and died. This inspired a revolt in northern Syria that was abetted by the Assyrians and the Egyptians under Horemheb. The arrival of the Hittite king himself at the head of the imperial armies was successful in reestablishing order. Mursilis died towards the end of the reign of Horemheb, after 25 years of leadership. He left his son Muwatallis a substantial and relatively secure empire. Egyptian colonial ambitions at the beginning of the Nineteenth Dynasty finally led to the inevitable confrontation between the two empires at the beginning of the reign of Ramses II, with the Battle of Kadesh. The battle was little better than a draw, and later in the reign of Ramses, the Hittites and Egyptians gradually grew more friendly as they faced a common enemy in the Assyrians. This was made official with a treaty and the marriage of a Hittite princess to the Egyptian pharaoh. The Hittite royal family of the New Kingdom may have come from Kizzuwadna, as Hurrian names begin to appear. The dynastic names of kings, however, remained Hittite. Hurrian influence and ideas began to percolate into Hittite culture, gaining ever more prominence throughout the New Kingdom.